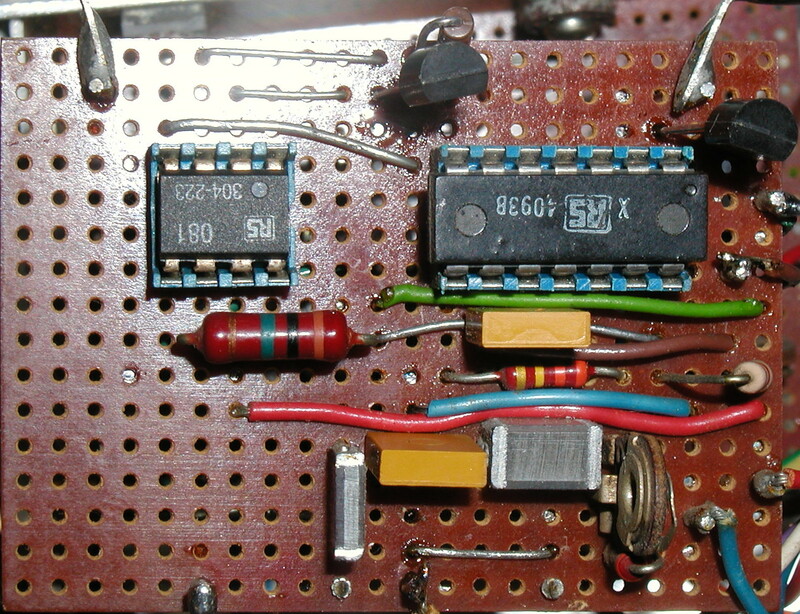 One thing I should mention is that when I first built this electronic components were far more expensive than they are these days (compared to income), so I quickly learned to scavenge whatever I could from any faulty kit, and to have my hand out when production kit had reached end-of-line and there was spare stock that would otherwise have been junked. Things were much more easy-going then and you could rock up at a factory on a bike and ask if there was any stuff being binned you could have. The result of this is that the generator is a mixture of actual design and using what was available. This is more obvious with the Square/Triangle board than anywhere else! I have two drawings this time. The original is here and then the revised one with some component changes/improvements. A square wave is unique in that its R.M.S. value and peak value are the same. Also, with the 'new' CMOS logic chips you can get rail-to-rail swings. Therefore, control the supply voltage and you've got exact output levels. I wanted to get somewhere near +10dBm (the R.M.S. 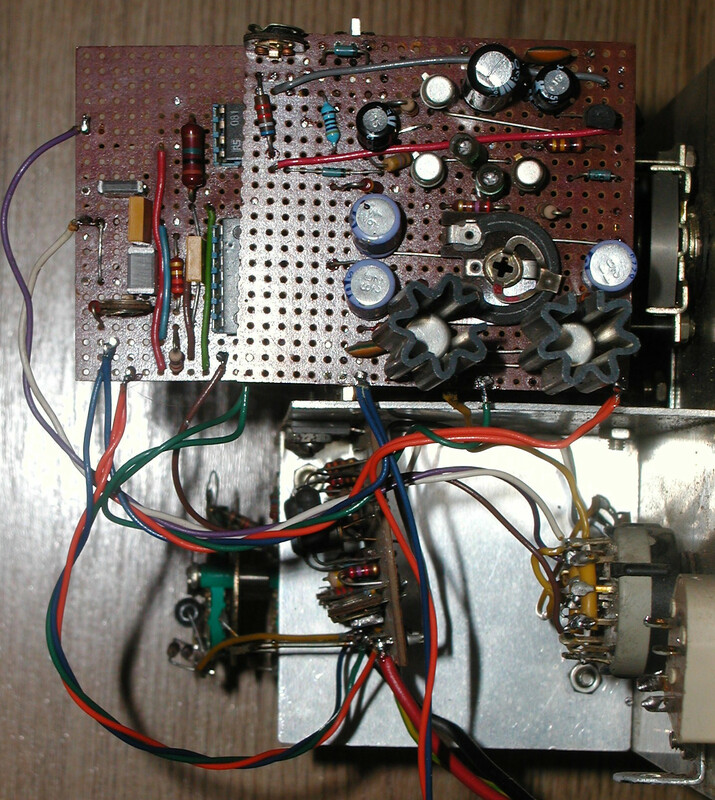 output from the oscillator). This is 2.434, so peak-to-peak 4.868. Therefore I had the bright idea of setting a supply of 5V with a zener diode. This was for a single element of a gate with a schmitt trigger input. Instant very easy and accurate square waves of 2.5V R.M.S. However, I needed to get that symmetrical around zero, hence the balancing resistors and preset. Also, I fed the input via a R/C filter (rather oversized cap) and further mark-space balancing to ensure I had a true 1:1 ratio - this is important for the triangle waveshape. What I hadn't taken on board at the time was that the triggering didn't need to take place at the zero crossing point of the incoming sinewave, it only needed to be symmetrical. That cap is now much smaller, and there is a resistor removed. The other change I've now made is to get a pair of 2.5V reference diodes, which are accurate enough for me to be able to dispose of the 5V zener and DC balancing network. The triangle conversion is very simple. Feed the inverting input of an op-amp with a square wave via a resistor and apply 100% feedback and you have a current source. Apply a constant current to a cap and you get a linear ramp. Combine the two and you get a triangle wave! Once again there is an 081 in there, whereas I'm sure I would have actually put my hand in my pocket and bought one of the latest (expensive) brand new 7611 CMOS amps. It didn't have to be fast, but it did need a very low bias current. The 10M resistor and 100n cap ensure there is 100% D.C feedback so effectively no offset, even if the square wave has a slight bias. The values are extreme enough to ensure that they don't change the triangle shape. The amplitude is determined by the incoming square wave amplitude and the ratio of the resistors and caps in the network. I chose values that resulted in an R.M.S. value very close to that of the square wave. Over the weekend, I was working on this again, and now (while it's raining) seems a good time to write up the details. First the square/triangle board I forgot to put up before. You can clearly see the new 2.5V references. Only one gate of the 4093 is used. 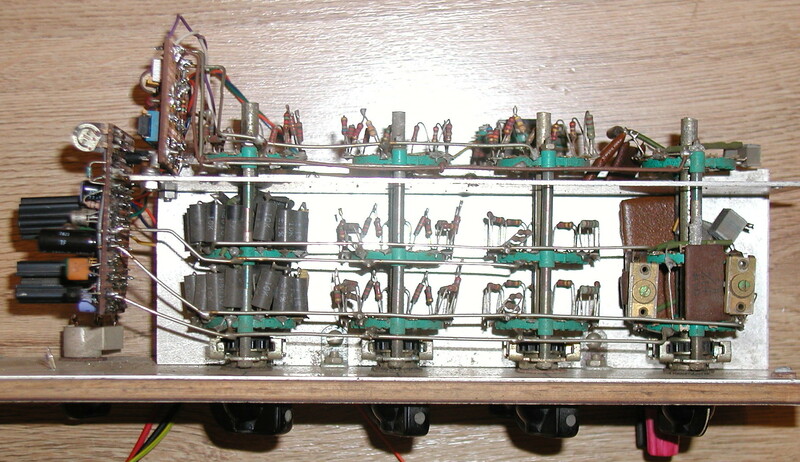 The others have their inputs wired to the + or - rails. Next, a look at the frequency selector switches from above before I put the cover back on. Those black things on the left-most switch, are 0.2% tolerance resistors. That had to be that close as they are the hundreds switch, and I would have bought those new. Next are fairly ordinary 2% ones, and 5% ones on the last resistor switch. Most of these have small padding ones as well to get exactly the right values. The last switch, with the caps, was very difficult to set up, and there are lots of padding ones on it. The top range 10kHz - 99.9 kHz had to have trimmers as well. Just taking the cover off shifts the frequency considerably and there are two tiny holes in it for a trimming tool! Needless to say, apart from blowing the dust out I haven't touched this. In spite of the age, I was pleased to find those switches are in perfect condition. Starting the reassembly, this is the end view, only possible with the old PSU removed. You can see the oscillator board quite clearly now, with the square/triangle on behind it, and the amplifier edgeways underneath. All wired up ready to go, apart from the slightly redundant power switch in the foreground. Finally we have the fully assembled rear view. The transformer and associated parts are gone, and one of the tagstrips has been re-purposed for the + and - 12V regulators. What was the mains lead is now the +- 18V supply from a new external PSU. I'll draw out the new PSU soon - like everything else it's a bit 'unusual' with a mixture of recycled and new parts! This is like electronic time travel! I love reading this post, in the same way I am following the guitar building and studio building posts. Watching, or reading about, skilled craftsmen is always rewarding. I cannot imagine any circumstances when I would ever need to design and build a signal generator from scratch, but somehow just knowing that there are people who can, and do to a high standard, makes the world a better place. My first (lazy) thought was to just get an off the shelf PSU with +/- 18V, but I quickly discovered that nobody makes such a thing. Next I investigated using a pair of plain 18V ones. Well this was possible, but the genny only draws 560mA and I couldn't find any less than 2A. These were far more expensive than ones rated at 4A or more! What to do? Well the answer was to have a look through my bits box and component draws, then finally when braving the 'secondary' store (a big scary box in the cellar) I hit the jackpot. Turning a single supply into a split rail one is common practice, and these days you can actually get self-contained chips to do it, but where's the fun in that? Here is the schematic of what I came up with. The two 51k resistors (conveniently close tolerance) set the half-way point that will become the 0V reference, and the OpAmp along with the transistors turn this into a low impedance than can hold it steady over a reasonable current unbalance. I seem to have quite a few 081s so that's what I used, along with the BD135/6 pair. Actual measurements showed a small drifting value from the genny right down in the microamps range. The network of resistors provides bias for the transistors as well as protection in the event of faults - like someone shorting a rail with a meter probe! The 3V zener is another protection measure against over-voltage, and doesn't actually do anything. The total voltage across the 1.5k resistors is 2.2V due to the comparatively low gain of the transistors (about 40). Subtracting the B-E voltages of the transistors leaves 1V for the 15 ohm resistors, giving a through current of about 30mA. The two LEDs aren't there just to look pretty. The absolute maximum supply for the OpAmp is +- 18V. I never like working at maximums, and the LEDs drop a couple of volts, so it's now +- 16V. As a convenient aside, if there is a significant current imbalance their brightness will become unequal. The output socket is a 270 degree 5 pin DIN - so no chance of any ordinary lead being plugged into it. pairing up the pins for the + & - rails ensures good contact and adequate current capability. The 0V needs very little. As you can see in this piccy, the power supply and box are properly earthed. There are two routes from the mains earth to the case (as is recommended). One is via the PSU terminal and it's case. The other is the shell of the DIN socket. 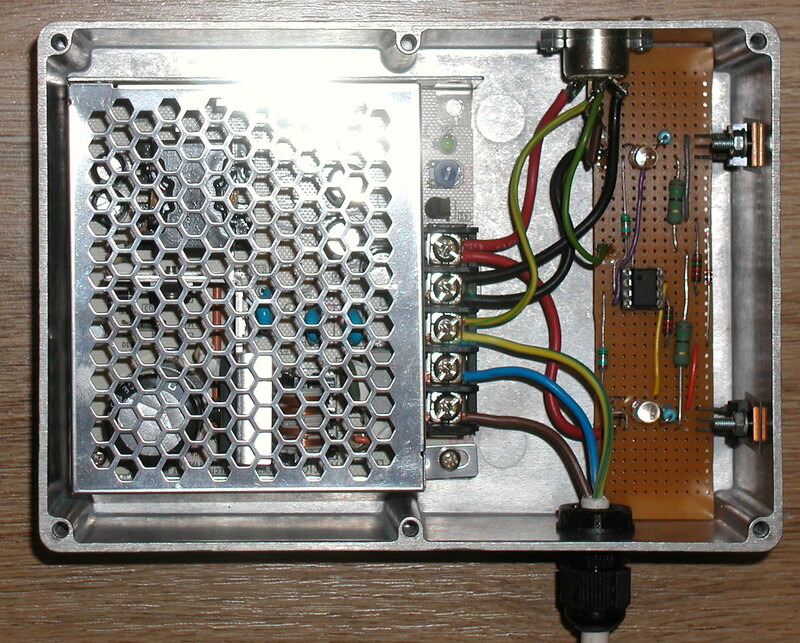 The output has only an antistatic bleed (4.7M) and rf bypass cap between that and the 0V rail. Good bit of recycling that!